In my previous post about my brother and sister-in-law’s trip to Italy, I talked about some of the things we did that weekend in Rome. We focused mostly on the Vatican, spending our time visiting the Vatican Museum and Garden, St. Peter’s Basilica and its dome, and they were lucky enough to attend the annual papal mass celebrating St. Peter and St. Paul, the patron saints of Rome (eventually I will get to writing a post on how you can reserve tickets to a papal mass). 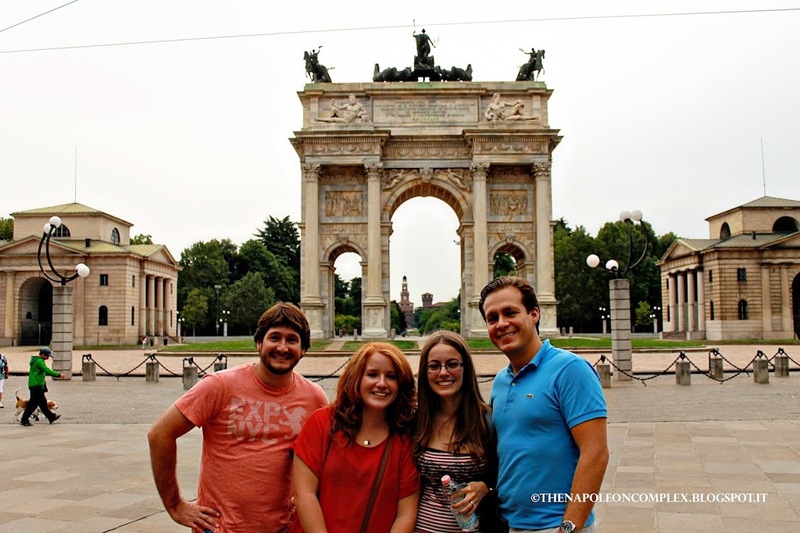 After, Carolina and Joaquin took a train to Venice on their own, then we met up with them in…Milan! Love this panoramic Joaquin took on his iPhone: Carolina & I waiting for Versace’s opening, going into Prada (we can only wish), and leaving Louis Vuitton. I had been dying to visit Milan, of course, because I’m a girl and Milan is known for being Italy’s fashion capital. Jaime was less excited about it. We agreed to spend only 24 hours in Milan for a few reasons: 1) Carolina and Joaquin only had a limited amount of time to see a lot of things, and 2) we weren’t able to reserve tickets to see Da Vinci’s Last Supper in the Convent of Santa Maria della Grazie (I cannot stress this enough, you must reserve your tickets three months in advance to even have a hope of seeing it). We arrived in late afternoon, picked up Carolina and Joaquin at the train station, then hit up the Navigli district to find some good aperitivofor a cheap dinner. Northern Italy, specially the Piedmont and Lombardy regions, are known for their amazing aperitivibefore dinner, where for the price of a drink you get access to a huge buffet of delicious Italian food. If you’re on a budget, you can really save a ton on dinner by timing yourself to go to aperitivi. Milan’s canal. The World Cup was still going on at that time so they had some cool things for kids. 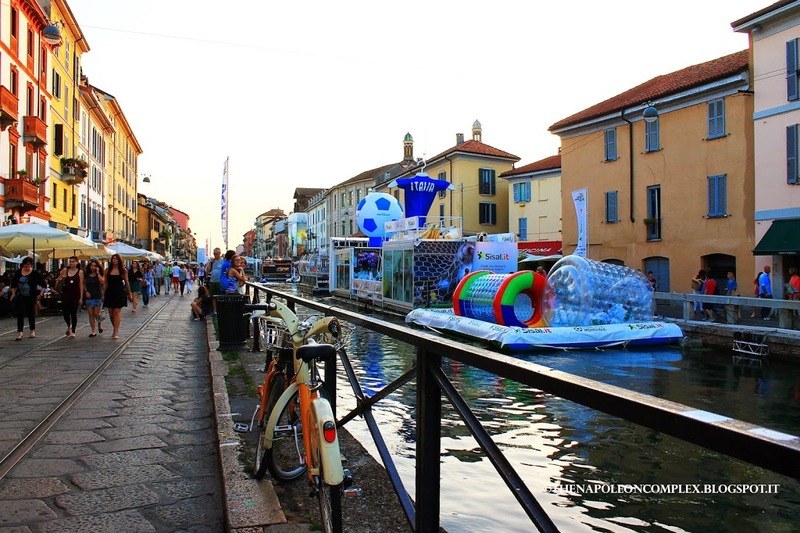 I didn’t know about the Navigli district until I started researching what to see in Milan, but for those of you who don’t know, Venice isn’t the only Italian city with canals—even if it’s by far the most famous. Milan also boasts its own canals (I use the plural loosely, as it’s really only two or maximum three) once built to navigate the city. Today, they are not used for the same purpose, but the area has become a pretty cool place with many restaurants lining the canals and young crowds hanging out. The next day we toured the Milan Cathedral. 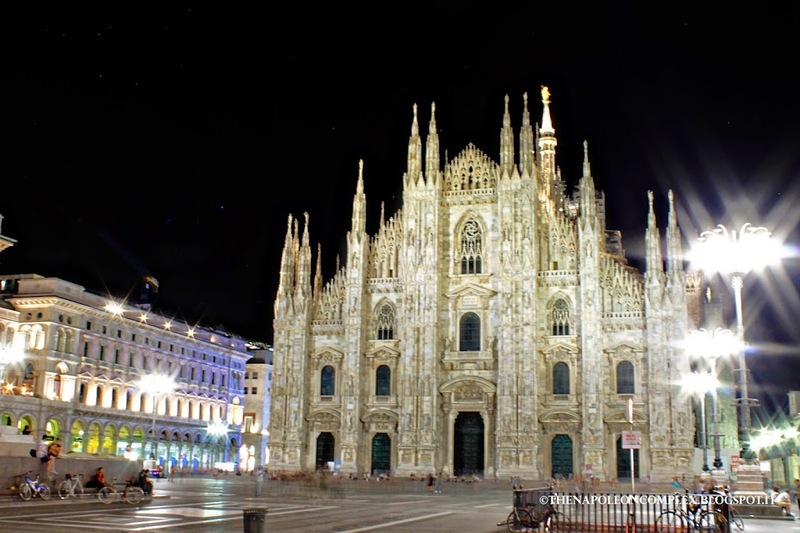 It is the largest cathedral in Italy; one of Italy’s most recognized landmarks, and one of the main reasons one goes to Milan, of course. Some of the highlights include the statue of Saint Batholomew Flayed, the saint carrying his skin over his shoulder (unfortunately, we have no pictures from inside the cathedral because you had to pay a fee to use the camera and the dim lighting rendered pictures worthless). Another interesting tidbit was a small red light bulb above the apse where one of the supposed nails from the Crucifixion of Christ is placed. The nail is displayed to the public once a year during a special celebration. We actually took this picture the night before we visited, but I like it better than the one we took during the day. After we took a stroll through Galleria Vittorio Emanuele II, right next to the duomo. Apart from the stores from some major fashion houses that are totally drool-worthy, it is one of the world’s oldest shopping malls and a predecessor of the modern enclosed mall. 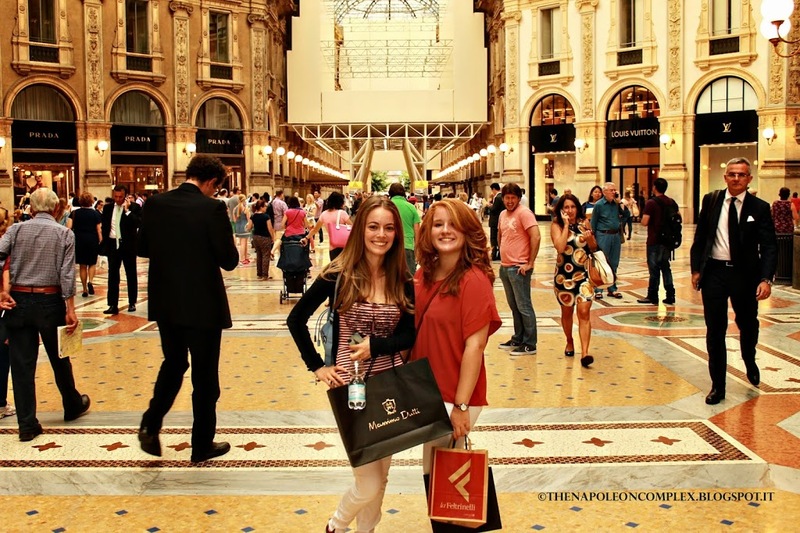 Once you walk through the Galleria, you reach a little plaza on the other side with the famous La Scala Theater. The faces of happy girls in their element. Jaime says my biggest wish is to come out of a mall, Gossip Girl style, with my arms full of designer bags….he’s kind of right, but shhh! I mentioned before that the Milan Cathedral is one of the main reasons people go to Milan, but I had another reason: la Cotoletta alla Milanese.Everyone knows this dish, even if it goes by different names: the Wiener Schnitzel in Germany, the Bistec a la Milanesa in Latin American countries, etc. The Italian dish, usually a breaded veal cutlet, influenced all of these variations. This is one of my favorite dishes ever (I’m a big fan of breaded and fried) and I had been looking forward to getting to eat it in its birthplace. 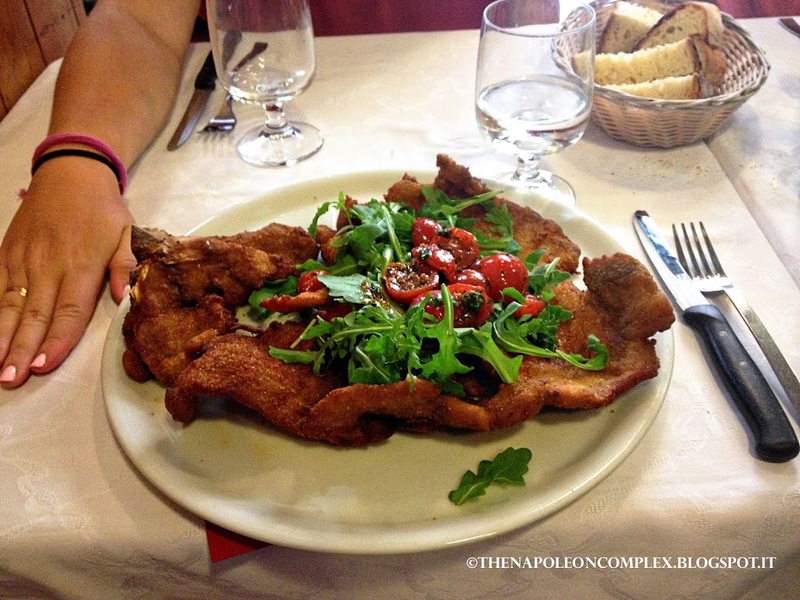 Jaime, knowing how important this was to me, found on an Italian site a list of the best restaurants in Milan to eat cotoletta alla Milanese. The restaurant was called Da Martino, a little out of the way of the center of the city, but totally worth the extra walk and metro ride. It was a small place, unpretentious, and full of men in business suits and Italian nonnas having their lunch. As a first dish we shared amongst the four of us two plates of risotto alla Milanese. Let me tell you, I was converted. I had never really liked risotto before Italy and I even had it once in Rome and it still didn’t impress me. This risotto, however, was excellent. It tasted great and with the parmeggiano over it, it was simply heavenly. It was lucky that we decided to share because once the star of the day came in, la cotoletta, we were floored by its size. It was so big that it barely fit on the plate! But it was the tastiest, juiciest (even though they don’t serve it with lemon, like the Cuban version I’m used to), cotoletta I have ever eaten. I still dream about this place. In fact, Da Martino became one of my favorite restaurants I’ve been to in Italy. Note the tomatoes with some herbs over them. Those were some of the most delicious tomatoes I have ever eaten in my life. We took a long walk to our car after and continued on to our next destination, which was a good thing because we needed the nap (except for our poor DD, Jaime) after being so stuffed. It would have been a sin to leave any of that delicious cotoletta, though. The faces of four people who are beyond happy at how stuffed they are. All in all, I can’t say that Milan, other than for its delicious signature dishes, really impacted me enough. In fact, I’d say that if you’re making a first trip to Italy, it shouldn’t be on your priority list. However, that being said, Jaime and I will probably make a return trip to visit the Last Supper, which is a UNESCO site after all, and maybeto see an opera production at La Scala (if we can justify spending an absurd amount of money on tickets). Either way, next year Milan will be hosting the world Expo, so it will definitely be an interesting time to visit! I LOVE Milan! Just spent five days there and was so glad I did. Writing up my foodie experience there as there seems to be so much of a food scene building there that’s it’s really exciting especially since we mainly have Italian spots in Florence! yeah I loved it too, 24 hours was not nearly enough time to be there, I think!